Sikkim, the cleanest state of India, is an abode of everything beautiful that nature has to offer. Surrounded by lofty rugged mountains, random waterfalls trickling down the mountains at every other corner, majestic rivers and glacial lakes are some of what Sikkim has to offer. Gangtok, the capital city of Sikkim, is the main centre of all activities that take place in Sikkim. Although, Gangtok itself is filled with places to see, weekends are for exploring. And since Sikkim is filled with natural beauty that never ceases to amaze, there are so many places that one can plan to explore from Gangtok. Read about the places that you need to plan on going to during a weekend, all located close to Gangtok. The oval-shaped Tsomgo Lake is a breathtaking lake that reflects different colours during different seasons, due to which it is considered to be sacred. 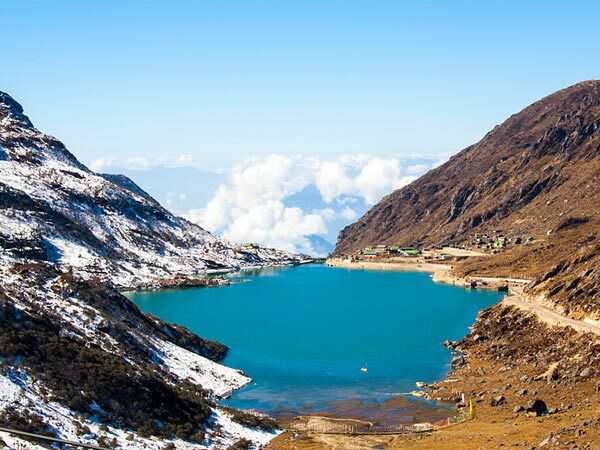 Also known as Changu Lake, the Tsomgo Lake is located only 40 km from Gangtok. Since the road further leads to the infamous Nathu La Pass, the road from Gangtok to Tsomgo Lake is phenomenal. Spend some time near the beautiful lake set against the backdrop of mountains and try yak riding around the lake. Travel another 17 km from the lake to reach Nathu La Pass, the open trading border between India and China. Namchi is a beautiful city which literally translates to "top of the sky" in Bhutia. It is home to the world's tallest statue of the Buddhist master Padmasambhava, also known as Guru Rinpoche. It is located just about 80 km from Gangtok and makes for a great getaway for a weekend. Some places you need to visit in Namchi include Samdruptse Hill where you can view the enormous statue of Padmasambhava overlooking the city, Chardham, Tendong Hill, Ralang Monastery, to name a few. Located at a distance of 112 km, Pelling is on the west of Sikkim and takes about 5 hours to reach from Gangtok. Pelling offers you the closest view to the magnanimous Kanchenjunga ranges from Sikkim. A visit to Pelling is incomplete without heading to the monasteries galore. Pemayangtse Monastery is one of the oldest and popular monasteries in West Sikkim. Khecheopalri Lake, Rabdentse Ruins and waterfalls found on the way are some of the points of interest in Pelling. Yumthang, popularly known for being the Valley of Flowers, is located 140 km from Gangtok. Yumthang is a mesmerising sanctuary of nature that is home to pristine rivers, hot springs, lush green rolling meadows, yaks and a valley full of breathtaking flowers. Shingba Rhododendron Sanctuary is part of the valley of flowers that has over 24 different species of beautiful rhododendrons. Avoid going to Yumthang between the months of December and March since the place is closed due to heavy snowfall. Found on the route connecting Gangtok and Pelling, Ravangla is a small town that is located 65 km from Gangtok. Have the perfect day out at Ravangla and visit Buddha Park, also known as Tagatha Tsal. Buddha Park is a huge park that is entirely dedicated to Buddha, with a huge statue of him in the middle. Go trekking and birdwatching in Maenam Wildlife Sanctuary at Ravangla. If you visit Ravangla during April-May, you can see orchids and rhododendrons blossoming. The picturesque village of Lachung which literally translates to "small pass" is almost always synonymous with Lachen, which is a nearby village all situated in North Sikkim. Lachung is situated about 26 km from Yumthang and 120 km Gangtok. One of the most important points of interest in Lachung, apart from breathtaking vistas of gushing waterfalls, glacial water bodies and tall dark mountains, is Zero Point. Also known as Yumesamdong, it is a perennially snowy region that happens to be the final point of India. Beyond this, you can only find the Indo-China border. For all the adventure junkies out there, Zuluk is the place you need to explore. This quaint village, located in East Sikkim, at the lower Himalayas, Zuluk, used to be the Silk Route of Sikkim. Silk Route used to be the trading route between India and Tibet. Now, the village is an offbeat destination that has 32 hairpin bends, perfect for an adventurous road trip. It is located 92 km from Gangtok that takes about 3 hours to be reached.